Department of Pharmaceutical Chemistry, Vaagdevi Pharmacy College, Bollikunta, Warangal - 506005, Telangana, India. ABSTRACT: Paracetamol is a well-known drug for its antipyretic, analgesic and anti-inflammatory activity. The drug being an OTC had been used more frequently than required. As a result of this overdosage of the drug caused a hepatotoxic effect. So to overcome this, an approach of PEGylation was chosen. 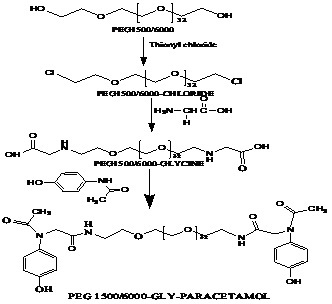 PEG 1500-Paracetamol, PEG 6000-Paracetamol, PEG 1500-Glycine-Paracetamol, and PEG 6000-Glycine- Paracetamol. The Prodrugs synthesized were subjected to in- vitro dissolution at λmax 256nm at pH 1.2, 4.5 and 6.8. The studies revealed that % drug release was more at pH 6.8 rather than at pH 1.2 and 4.5, for PEG 6000-Gly-Paracetamol than PEG 1500-Gly-Paracetamol and also PEG 6000-Paracetamol % drug release was more than PEG 1500-Paracetamol. 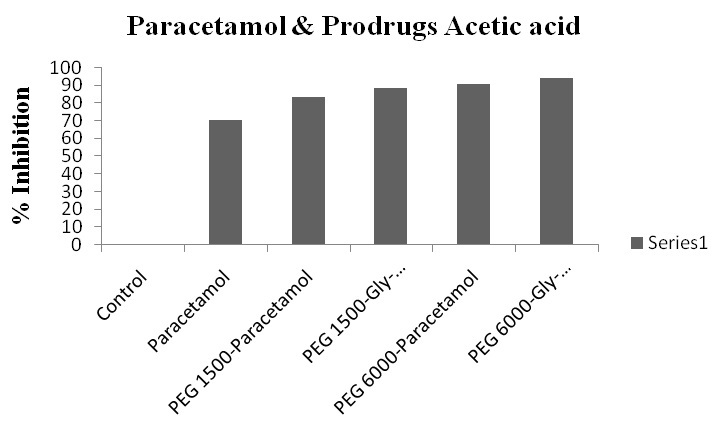 In-vivo Analgesic activity by Tail Immersion method revealed that PEG 6000-Gly-Paracetamol and PEG 1500-Gly-Paracetamol has higher analgesic activity than PEG-PEG 6000-Paracetamol and PEG 1500-Paracetamol, which indicates the influence of spacer, i.e., Glycine on drug release. 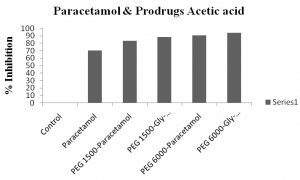 In-vivo Analgesic activity by hot plate method and acetic acid methods revealed that PEG 6000-Gly-Paracetamol and PEG 6000-Paracetamol has higher analgesic activity than PEG 1500-Gly-Paracetamol and PEG 1500-Paracetamol, which indicates the influence of higher molecular weight on drug release. It should be readily transported to the site of action. It has to be converted to an active form, should retain tissue as such without degradation.Prodrugs are classified as carrier-linked prodrugs and bio precursors. Carrier linked prodrugs are further classified as bipartite-comprises of one carrier group attached to the drug, tripartite-comprises of one carrier group, linker, and drug, mutual prodrugs-comprises of two drugs linked to each other. Polymers: Polymers 3, 4 were used to design many polymeric prodrugs or polymer drug conjugates. Any polymer 5, 6 can be used for any class of drug. The ideal properties required for a polymer should be inert, nontoxic, functional groups required for covalent binding 7, 8, availability and biocompatibility, biodegradability, easily excreted. Polymers are classified as polymer based on backbone, i.e. polymer with carbon chain namely poly ethylene glycol, polypropylene, poly vinyl pyrrolidone and polymer with hetero chain namely cellulose, amylase. Another classification is natural polymers and synthetic polymers 9, 10. Natural polymers include cyclodextrins, dextran whereas synthetic polymers are further classified as biodegradable includes polylactic acid, poly amino acids and non-biodegradable include cellulose acetate propionate, hydroxyl propyl methyl cellulose. 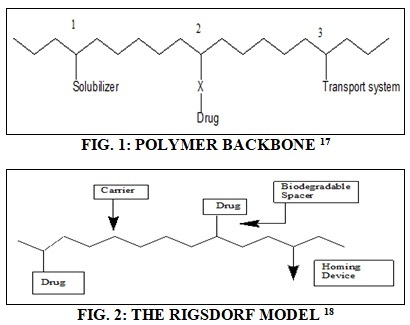 Types of polymer-drug linkages include mainly ester or amide. Nondegradable synthetic polymers 11, 12 used were mainly PEG (Poly Ethylene Glycol). 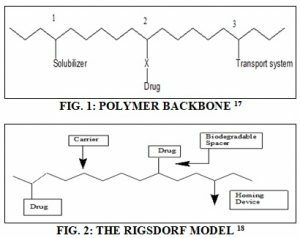 Polymeric 13, 14 prodrugs was first proposed by H. Ringsdorf, it includes drug, polymeric backbone as carrier and spacer linked to a drug with polymeric backbone. Linkers or Spacers used are usually amino acids or peptides. Polyethylene glycol is available in different molecular weights, but for this study 1500 and 6000 molecular weights were chosen 15, 16. Drug: Paracetamol 19, 20, 21 is a well-known drug for its antipyretic, analgesic and anti-inflammatory activity. It belongs to a class of aniline analgesics. It is a weak inhibitor of prostaglandin synthesis, COX1, and COX2. The usual dose of Paracetamol for adults is 325-650 mg daily every 4-6 h 22, 23, 24. Adverse effects of Paracetamol include acute hepatic failure and dose more than 2000 mg cause upper GI complications. The drug being an OTC had been used more frequently than required. As a result of the overdosage, it results in Hepatotoxicity 25, 26, 27. So, to overcome this, an approach of PEGylation was chosen. PEGylation is a process in which polymer Poly Ethylene Glycol (PEG) of different molecular weights were chosen, i.e. 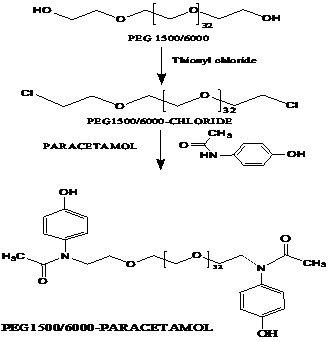 PEG 1500, and PEG 6000 was attached covalently to the drug by amide linkage 5, 6, 15, 16. MATERIALS AND METHODS: Polyethylene glycol 1500/6000, Thionyl chloride, Pyridine, Paracetamol, Dichloromethane, Anhydrous potassium carbonate, Neutral Alumina, Di cyclohexyl carbodiimide, Dimethyl aminopyridine, Diethyl ether, Dimethyl formamide, Methanol, Glycine. Preparation of Prodrugs of PEG 1500/6000-PCM: 1.5 g of polyethylene glycol 1.6 ml of pyridine were taken in a 250 ml two-necked round bottom flask fitted with stirrer & condenser. 4.5 ml of Thionyl chloride was added drop by drop for 30 min and the temperature was maintained at 40 ºC. After complete addition, the temperature was raised to 70 ºC & the reaction was carried out for 22 h. The residue was dissolved in dichloromethane & dried over anhydrous potassium carbonate & alumina & filtered. The filtrate was reprecipitated by cold diethyl ether. To this, a solution of DCC (Di Cyclo hexyl Carbodiimide) 1gm and 0.6 gm of DMAP (Di-Methyl Amino Pyridine) in 10 ml of DMF (Di-Methyl Formamide) was added. The flask was kept in an ice bath, and the temperature was maintained at 0 ºC, to this Paracetamol was added for 10 min. The flask was placed on a magnetic stirrer and allowed to continue stirring for seven days for the coupling reaction to occur at room temperature. The product obtained was dissolved in DCM (Dichloromethane) and reprecipitated by cold diethyl ether 5, 6, 15, 16. The PEG 1500-PCM and PEG 6000-PCM were characterized by TLC (DCM: Methanol 3:2) I.R and N.M.R. Preparation of PEG 1500/6000-Glycine: PEG 1500/6000 1.5 gm and 1.6 ml of pyridine were taken in a two-necked round bottom flask, and 20 ml of DMF was added and placed on a magnetic stirrer. To this 0.18 gm of glycine was added in small portions for 3 h maintaining at room temperature. Then the contents were refluxed by attaching a condenser, maintaining a temperature of 130 ºC for 21 h. The residue was dissolved in DCM and re-precipitated by an excess of cold diethyl ether. PEG 1500/6000-Glycine was characterized by TLC (DCM: Methanol 3:2), I.R and N.M.R. Preparation of PEG 1500/6000-Gly-PCM: A solution of DCC 1 gm in 10 ml of DMF and 0.6 gms of DMAP in 10 ml of DMF were taken in a beaker. The mixture was added drop by drop to another beaker containing a solution of 0.4 gm of PEG 1500/6000-Gly in 20 ml of DMF. Paracetamol 1 gm was added in portions to the above mixture at 0 ºC for 10 min. The contents were transferred to a round bottom flask with a condenser and placed on a magnetic stirrer. The coupling reaction was carried for 7 days at room temperature. The residue was dissolved in DCM and reprecipitated by an excess of cold diethyl ether 5, 6, 15, 16. PEG 1500/6000-Gly-PCM was characterized by TLC (DCM: Methanol 3:2), I.R and N.M.R. In-vitro Drug Release: The λmax of the pure drug was determined and found to be 256 nm. In-vitro dissolution studies were carried out by using Electro lab USP 8 basket apparatus. A standard concentration of the drug was prepared and the absorbance values were noted. The drug was accurately weighed 1 g and taken in a volumetric flask and dissolved in 5 ml of methanol, and the volume was made up to 1000 ml using distilled water, the concentration obtained was 1 mg/ml. From the above solution 10 ml was pipetted out and taken in a volumetric flask, and the volume was made up to 100 ml, the concentration obtained was 100 µg/ml. From the 100 ml volumetric flask 1 ml, 2 ml, 3 ml, 4 ml, 5 ml, 6 ml and 7 ml solutions were pipetted and transferred to 10 ml volumetric flasks, the concentrations obtained were 10 µg/ml, 20 µg/ml, 30 µg/ml, 40 µg/ml, 50 µg/ml, 60 µg/ml and 70 µg/ml respectively. The absorbance of the drug solutions was measured at λmax 256. A graph of concentration v/s absorbance was plotted and a standard graph of was obtained. The standard drug was subjected for drug release at pH 1.2, 4.5 and 6.8 individually and 5 ml aliquots were withdrawn from the basket at time intervals of 5, 10, 15, 30, 45 and 60 min, and % cumulative drug release was noted using standard graph. A graph was plotted % cumulative drug release v/s time in min. The synthesized prodrugs were taken, and an amount equivalent to 10 mg of pure drug was weighed accurately and packed in an empty capsule shell. These capsules were placed in dissolution apparatus containing 900 ml of pH 1.2 buffer. The dissolution test was carried out at 37 ± 0.5 ºC, and aliquots of 5 ml samples were collected and time intervals (5, 10, 15, 30, 45 and 60 min) and replaced with equivalent fresh buffer to maintain sink conditions. The same procedure was followed for pH 4.5 and 6.8. A graph was plotted between % cumulative drug release v/s Time in min 5, 6, 15, 16. Tail Immersion Method: For the analgesic activity by this method, the rats were divided into six groups consisting of 6 animals each. This method involves immersing end of the tail in warm water at 55 ºC. Within a few seconds the rat reacts by withdrawing the tail and the reaction time in seconds is noted. The reaction time before and after administration of the drug was noted for each, i.e. standard drug Paracetamol, PEG 1500-PCM, PEG 6000-PCM, PEG 1500-Gly-PCM and PEG 6000-Gly-PCM 5, 6, 15, 16, 28. Hotplate Method: For the analgesic activity by this method, the rats were divided into six groups consisting of 6 animals each. The temperature of the hotplate was maintained at 55 ± 0.5 ºC. 1st group controlled, and observed for jump response for 15 sec. 2nd group received standard drug (Paracetamol) 10 mg/kg, 3rd group received PEG1500-prodrugs, 4th group received PEG1500-Gly-prodrugs, 5th group received PEG6000-prodrugs and 6th group received PEG6000-Gly-prodrugs and placed on hotplate and reaction time was recorded before and after (0, 30 min, 60 min). The % inhibition was calculated by equation 5, 6, 15, 16, 28. Statistical Analysis: The results are expressed as mean ± S.E.M. Difference in mean values between the groups were analyzed by One-way analysis of variance (ANOVA). The significance was assessed as p<0.05. Acetic Acid-Induced Writhing Method: For the study by this method the rats were divided into 6 groups consisting of 6 animals each. Acetic acid was used to induce wriths. 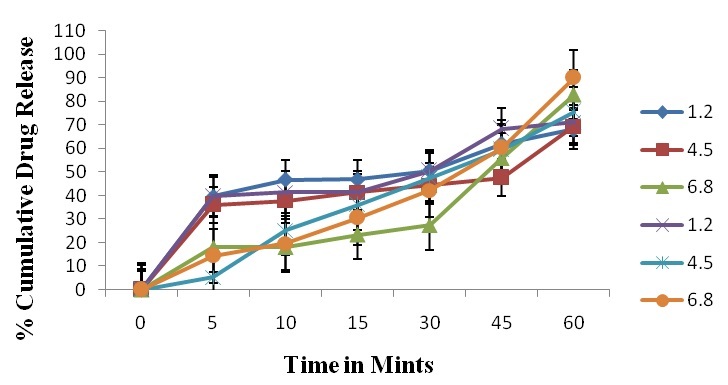 1st group was administered acetic acid intraperitoneally and recorded for the onset of wriths throughout 15 min. Two half wriths were counted as 1 full writh. 2nd group received standard drugs (Paracetamol) 10 mg/kg, after 3 h acetic acid was administered and wriths were noted. 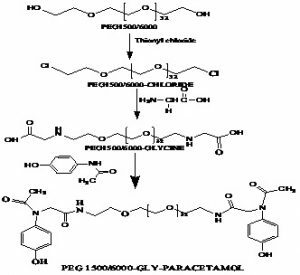 3rd group received PEG1500-prodrugs, 4th group received PEG1500-Gly-prodrugs, 5th group received PEG6000-prodrugs and 6th group received PEG6000-Gly-prodrugs after 3 h acetic acid was administered and a number of wriths were noted and compared with control. The % inhibition was calculated by equation 5, 6, 15, 16, 28. I.R: C-O-C- 1116 cm-1, CH str- 2850 cm-1, C-O str-1147 cm-1, C-C str-1220 cm-1, C-N str-1184 cm-1, Aromatic CH-1570 cm-1, C=O-1626 cm-1, Di substituted Benzene-802 cm-1, 918 cm-1, Phenolic OH-3390 cm-1. N.M.R: 1-1.5 δ-CH3 protons (t) (6), 1.6-3.5 δ-CH2 (m) (38) singlets, 5.9-6.1 δ-OH (d) (2) singlets 5.5-10.1 δ-Benzene (m) (16) singlets. I.R: C-O-C- 1116 cm-1, CH str- 2850 cm-1, C-O str-1147 cm-1, C-C str-1220 cm-1, C-N str-1184 cm-1, Aromatic CH-1568 cm-1, 1626 cm-1, Di substituted Benzene-837 cm-1, 943 cm-1, Phenolic OH-3390 cm-1, C=O-1686 cm-1, Aliphatic NH-3524 cm-1. N.M.R: 1-1.3 δ-CH3 protons (t) (6) singlets, 1.4-3.5 δ-CH2 protons (m) (23) singlets, 3.0-3.1 δ-NH protons (d) (2) singlets, 6.1-6.3 δ-OH protons (d) (2) singlets, 5.5-8.2 δ-Benzene (m) (18) singlets. Discussion: % drug release of PEG 1500-PCM and PEG 6000-PCM was more in 6.8 buffer as compared to the 4.5 and 1.2 buffers. 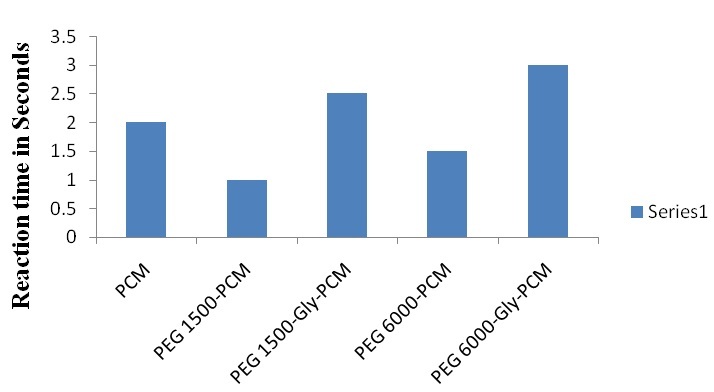 Discussion: PEG 1500-Gly-PCM and PEG 6000-Gly-PCM prodrugs have exerted more analgesic activity than PEG 1500-PCM, PEG 6000-PCM, and standard Paracetamol. This indicates that spacer (Glycine) has a role in the release of the drug. 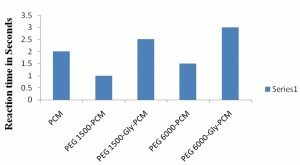 Discussion: PEG 6000-PCM and PEG 6000-Gly-PCM prodrugs have exerted more analgesic activity than PEG 1500-PCM, PEG 1500-Gly-PCM, and standard Paracetamol. This indicates that spacer (Glycine) and also molecular weight of the polymer has a role in the release of the drug. CONCLUSION: It can be concluded that prodrugs of Paracetamol may be used for enhanced Analgesic activity and also reducing the intervals between the dosage of the drug. ACKNOWLEDGEMENT: I thank Vaagdevi Pharmacy College for providing me the facility to publish my paper. CONFLICT OF INTEREST: The Author does not have any conflicts of interest regarding publication of this paper. Cavallaro G, Licciardi M, Caliceti P and Giammona G: Synthesis, physicochemical and biological characterization of a paclitaxel macromolecular prodrug. European Journal of Pharmaceutics and Biopharmaceutics 2004; 58: 151-159. Zacchigna M, Di Luca G, Maurich V and Boccu E: Syntheses, chemical and enzymatic stability of new poly (ethylene glycol)-acyclovir prodrugs. II Farmaco 2002; 57(3): 207-214. Zacchigna M, Luca GD, Cateni F and Maurich V: Improvement of warfarin biopharmaceutics by conjugation with poly (ethylene glycol). European Journal of Pharmaceutical Sciences 2004; 23: 379-384. Bersani C, Berna M, Pasut G and Veronese FM: PEG-metronidazole conjugates: synthesis, in-vitro and in-vivo II Farmaco 2005; 60: 783-788. Kemisetti D, Manda S, Satla SR, Aukunuru J and Rapaka NK: Preparation of Aceclofenac prodrugs, in-vitro and in-vivo International Journal of Pharma and Biosciences 2014; 5(3): 239-253. Kemisetti D, Manda S, Aukunuru J and Rapaka NK: Polymeric prodrugs of Diclofenac and in-vivo International Journal of Chem Tech Research 2014; 6(5): 2637-2644. Maniruzzaman M, Lam M, Molina C and Nokhodchi A: Study of the transformations of micro/nano crystalline Acetaminophen polymorphs in Drug-polymer binary mixtures. AAPS PharmSciTech 2017; 18(5): 1428-1437. Sharma M and Trout B L: Effect of pore size and interactions on Paracetamol Aggregation in porous poly ethylene glycol diacrylate The Journal of Physical Chemistry B 2015; 119(25): 8135-8145. Zhu A, XU G, Lingling LL, Zhou YH and Kan X: Sol-Gel Imprinted polymers based electrochemical sensor for Paracetamol recognition and detection. Analytical Letters 2013; 46(7): 1132-1144. Souza AAD and Shegokar R: Polyethylene glycol (PEG): A versatile polymer for pharmaceutical applications. Expert Opinion on Drug Delivery 2016; 13(9): 1257-1275. Pour AY, Modarress H, Goharpey F and Iranag SA: Interaction of PEGylated anti- hypertensive drugs, Amlodipine, Atenolol and Lisinopril with lipid bilayer membrane: A molecular dynamics simulation study. Biochimica et Biophysica Acta (BBA) Biomembranes 2015; 1848(8): 1687-1698. Ali HS, Khan GA, Babiker MA, Elhaj, Ajaji MA and Saad R: Evaluation and Formulation of Paracetamol matrix Sustained Release tablets using natural polymers. Journal of Innovations in Pharmaceutical and Biological Sciences 2016; 3(4): 85-91. Basso A, Summers B, Bresnar C and Serban S: An investigation into the effect of chemical and physical polymer structure on Reverse phase extraction of small molecules such as Paracetamol and Halo acetic acid. Chromatography Today 2016; 26-30. Stojakovic J, Baftizadeh F, Bellucci MA, Myerson AS and Trout BL: Angle directed nucleation of Paracetamol on Biocompatible nanoimprinted Crystal Growth and Design 2017; 17(6): 2955-2963. Kemisetti D, Manda S, Rapaka NK and Jithan AV: Synthesis of Nimesulide conjugates, in-vitro and in-vivo Derpharma Chemica 2014; 6(2): 317-329. Kemisetti D, Manda S, Aukunuru J, Chinnala K and Rapaka NK: Synthesis of prodrugs of Mefenamic acid and their in-vivo International Journal of Pharmacy and Pharmaceutical Sciences 2014; 6(7): 437-442. Elvira C, Gallardo A, Roman JS and Cifuentes A: Covalent polymer-drug conjugates. Molecules 2005; 10: 114-125. Hoste K, De Winne K and Schacht E: Polymeric prodrugs. International Journal of Pharmaceutics 2004; 277: 119-131. Obeidat WM, Nokhodchi A and Alkhatib H: Evaluation of Matrix tablets based on Eudragit E100/Carbopol 971P combinations for controlled release and improved compaction properties of water-soluble model drug Paracetamol. AAPS Pharm Sci Tech 2015; 16(5): 1169-1179. 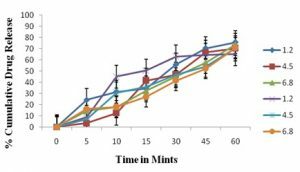 Akel H, Madani F and Ibrahim W: Preparation of Paracetamol microcapsules by complex coacervation and studying the effect of some factors influencing micro encapsulation yield and efficacy. Research Journal of Pharmacy and Technology 2017; 10(10): 3271-3275. Sudhir M, Mounika M, Jyothi N, Ali SKL, Anand JT and Komili M: Formulation and characterization of Fast Dissolving films containing Paracetamol. Indo American Journal of Pharmaceutical Research 2016; 6(11): 7098-7110. FAtta N, Ahmed G and El-Said DM: A Novel electrochemical sensor for Paracetamol based on β-cyclodextrin/Nafion/Polymer nanocomposite. International Journal of Electrochemical Science 2015; 10: 1404-1419. Chandran SC, Vipin KV, Augusthy A, Muhammed STK and Sabna NS: Effectiveness of sodium CMC as a polymer for development of transdermal patches containing Paracetamol IP in Paediatric category. British Biomedical Bulletin 2014; 2(1): 174-186. Sheykhaghaei G, Hossainisadr M, Mahkam M and Seyednezami K: Synthesis of Nano-sized molecularly imprinted polymer for selective extraction of Paracetamol. Extensive Journal of Applied Sciences 2016; 4(2): 61-66. 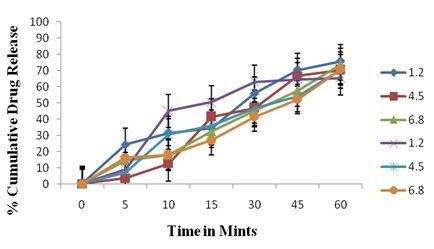 Ramalingam N, Parvin S, Binulal C, Palanivelu M, Surendiran SN and Ganesan B: Formulation and Evaluation of Paracetamol loaded mucoadhesive microspheres. International Journal of Pharmaceutics and Pharmacology 2017; 1(2): 106-116. Tung BT, Hai NT and Son PK: Hepatoprotective effect of phytosome curcumin against Paracetamol induced liver toxicity in mice. Brazilian Journal of Pharmaceutical Sciences 2017; 53(1): 1-13. Kulkarni SK: Hand book of Experimental Pharmacology. Vallabh Prakashan 1999: 123-128. Kemisetti D: Synthesis of Paracetamol-PEG prodrugs, in-vitro and in-vivo evaluation. Int J Pharm Sci & Res 2019; 10(2): 578-85. doi: 10.13040/IJPSR.0975-8232.10(2).578-85. Authors Address: Department of Pharmaceutical Chemistry, Vaagdevi Pharmacy College, Bollikunta, Warangal, Telangana, India.